m a y f i l e s . . .: Who Me? Berkeley's ears are still full of fluid. We are debating whether to insert tubes. Tubes have been a blessing and a curse to Ellery. Currently the surgery is scheduled a week from Friday. The pulmonologist wants to do a Bronchoscopy at the same time. This would require an overnight stay because Berkeley still has oxygen requirements during sleep. Brent and I go back and forth if this is the right thing to do, we just wonder if we might have enough information from the upcoming bronch on Ellery, that it would be unnecessary on the baby. But then again, Ellery was on oxygen for 3 weeks, Berkeley is 4 months old now. So many questions. To be honest, I don't sleep very well. Last night Berkeley set her alarm off every time the cannula came out of her nose. It hasn't been that bad for a while. What is difficult is how erratic this seems to be. 2 weeks ago she went 3 nights in a row on room air, then she took a big jump backwards. It is hard to know what to think. Thinking about you guys every, single day. I can't imagine having to make such hard decisions, but through the help of our Heavenly Father I'm sure you guys will do the right thing! 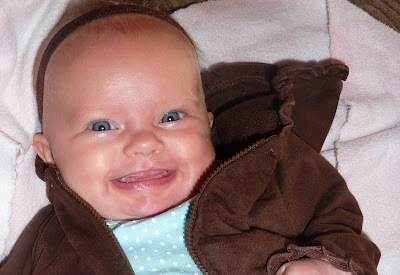 I love how big she's getting and that smile, precious!!!! Did I Mention He Jumps?